Wisconsin Book Festival: Read Local! Author Showcase Free. 21 authors all day. Fast and fun talks, book signings. Middleton Public Library, 7425 Hubbard Ave., Middleton, Wis.
“Scripting Your Story” with Christine DeSmet and others talking about screenplay writing. Books will be on sale to benefit the library. Gail Borden Public Library, 270 N. Grove Ave., Elgin, Ill.
For those on Facebook, please stop by—and share my posts. I focus on writing tips and news, authors and their new books. And of course there’s news about fudge and the Fudge Shop Mystery Series. Visit me on Facebook today! Belgian Heritage Center in Namur at 1255 County Road DK (near Brussels, Wis.). 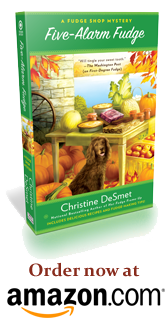 A kermis is a fall harvest celebration. Everybody is welcome for the free live music. You don’t need to be Belgian to enjoy the beer, booyah, and Belgian pies, PLUS ice cream made with a John Deere tractor. Add raffles and my books on sale. The fun time is a fundraiser for the Center. At the kermis, you’ll see the places found in my new mystery: St. Mary of the Snows church, which is now the Belgian Heritage Center; the old country school where the nuns taught; a roadside chapel; the historic cemetery and gravestones of early Belgian settlers that hold important clues; and more. Visit the Namur Belgian Heritage Foundation on Facebook. I now post on Facebook, too. Please visit me there for news and events!